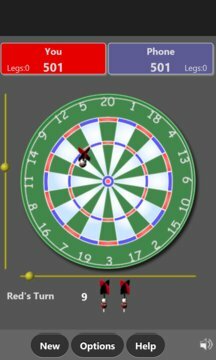 Play darts with phone, you may choose score 501, 301 or 101. The game rules are the same as a standard game of darts. When it is your turn, there are two moving points to locate the target, tap anywhere to stop them. You must tap twice, Once for the horizontal co-ordinates and once for the vertical co-ordinates.